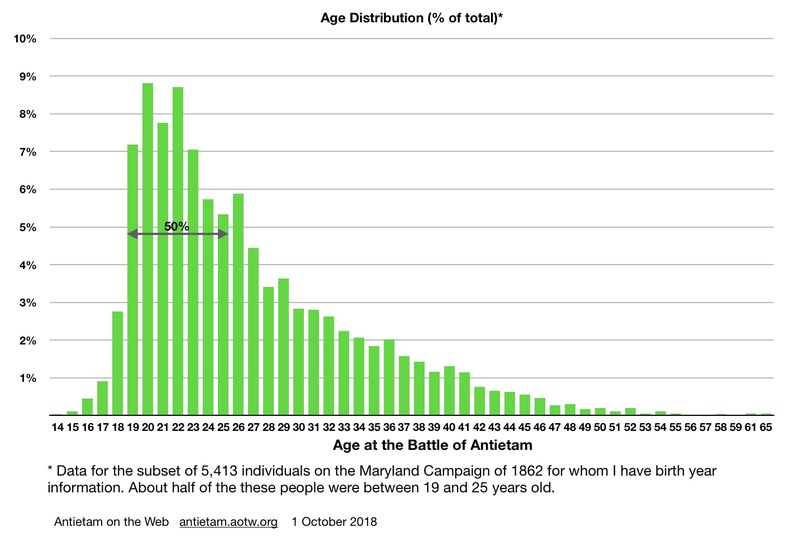 I am pleased to report that I’ve just added the 16,000th person to the Antietam on the Web (AotW) database. There’s much more to the AotW website than people, of course, but they’re what keep me going at it year in and year out. I’d be very surprised if questions or comments don’t pop into your mind as we go. I encourage you to share them at the bottom of this post. 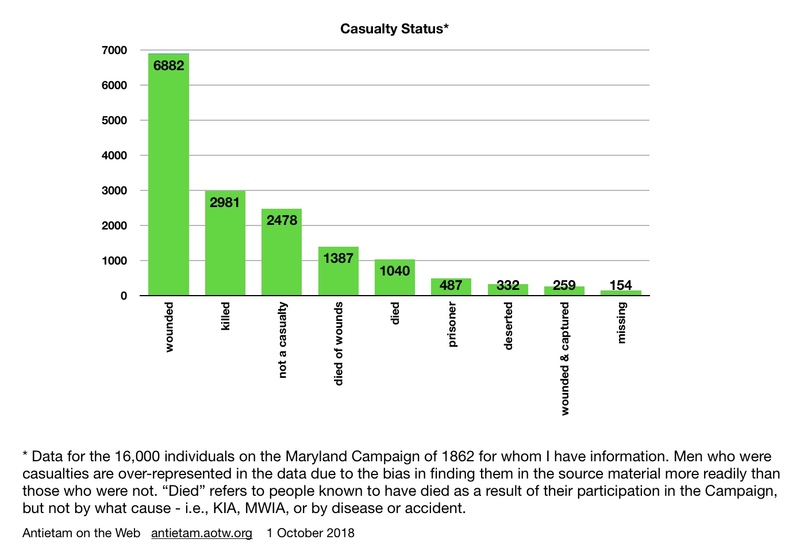 This is, broadly speaking, the ratio found in the total numbers of troops from each side on the campaign in Maryland in 1862, but I still feel I need to work harder on Confederate units to close the gap. 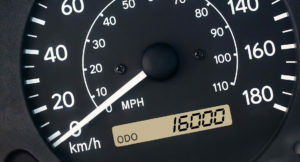 …for a total of 1250 images. I’m behind on Confederates, clearly, though there are probably good reasons for that. I believe I have listed virtually all of the General Officers and Colonels who were present. I should hope so – I started with them first, more than 20 years ago. 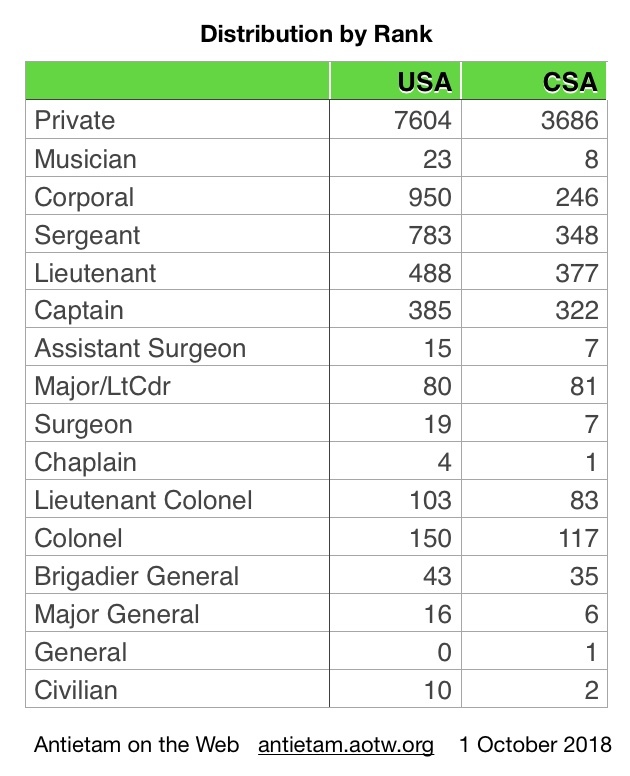 The number of soldiers of other ranks, notably enlisted men, will continue to grow. 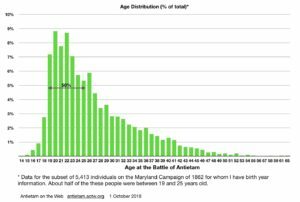 Here’s a distribution by age at the time of the battle (click any chart to see a much bigger version). This chart represents a sample of about a third of all the individuals in the database; the ones for whom I have birth year data. So far, the youngest I have was 14 years old, and the oldest, 65. 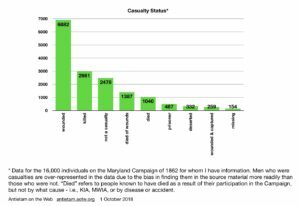 Here’s a look at how many of the 16,000 were casualties on the Campaign. Rosters and regimentals which list casualties are among my best sources for figuring out who was at Antietam, so it’s no surprise that the vast majority of the people in my database were casualties. 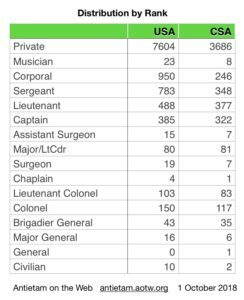 So many of the other soldiers who were there were not mentioned in documentation of any kind, and will probably never come to my attention as a result. Not that I have any shortage of documentation still to get to. Finally, here’s a lengthy chart showing how many came from each state; what I call their home state. For most people that was the state of their volunteer unit, but there are plenty of exceptions. These are modern US postal state codes. And, no, West Virginia didn’t become a state until 1863 – but I’ve chosen to identify members of the 7th (West) Virginia Infantry and two cavalry detachments as being from there. OK, so there’s some top-level information about the campaign participants in the AotW database so far. Let me know if there are other slices/dices you’d like me to try, and I’ll add to this set. I have two letters from someone who was at the battle of Antietam. I am unable to make heads or tails out of them. If you would like to see them I will mail you scans of the letters. Maybe you will understand them better than me. If I could find the family I would be happy to give the letters to them. Thanks for the note, Martin. I’ve sent you an email as well. 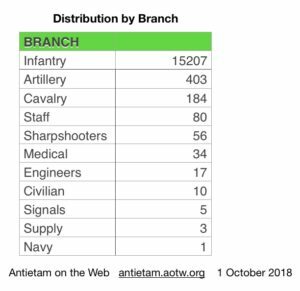 I’m always happy to look at Antietam materials sent to my email.